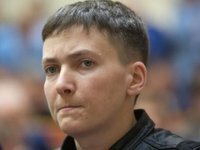 Ukrainian MP Nadiya Savchenko has decided to go on a dry hunger strike to secure her constitutional and statutory rights and freedoms, according to a statement posted on Savchenko's Facebook page on December 5 afternoon. "As a political detainee, Nadiya Savchenko is announcing a dry hunger strike until her rights and freedoms under the Constitution of Ukraine and current legislation are guaranteed," the statement said. Her decision was prompted by the actions of the SBU State Security Service of Ukraine investigators, who "intimidated and pressured the people's deputy [...], demanding that her lawyers immediately read the case materials so that the trial can begin immediately in exchange for the opportunity to see her relatives and aides, restore electronic keys, and open a bank account for registration as a Ukrainian presidential candidate," the statement said. Savchenko and her lawyers are currently studying the materials in the case against her and Volodymyr Ruban. The investigation into the pair was completed on August 1. Valentyn Rybin, Ruban's lawyer and the head of Officer Corps, an organization for the liberation of prisoners of war, notified investigators on August 30 that he had finished studying the materials. Savchenko has been in custody since March 23. The Verkhovna Rada voted on March 22 to grant Prosecutor General Yuriy Lutsenko's request that she be arrested and held accountable. On October 25, Kyiv's Shevchenkivsky District Court extended Savchenko's imprisonment until at least December 23.